Writers come in all different flavours. You’ll find the ones that create one interesting series and stick writing only for that series for the rest of their lives. Then you have the ones that will try and write something else, but fail, and end up returning to their most popular work. And finally you’ll have the ones who can create intriguing world after world after world, never failing to come up with something interesting and new. The four novellas in Quatrain are set in worlds I’ve created for Archangel, Heart of Gold, Summers at Castle Auburn, and Mystic and Rider. “Flight” follows a former angel-seeker who used to be in love with the Archangel Raphael and now is determined to keep her beautiful niece from making her same mistakes. “Blood” is the story of a fierce young gulden man who comes to the city to seek his mother, whom he hasn’t seen since he was a boy and she ran away from his abusive father. In “Gold,” a crown princess escapes the hazards of war by hiding among the fairylike aliora, where she encounters an altogether different sort of danger. And in “Flame,” the mystic Senneth uses her magic to save a little girl, an act that wins her new friends but puts her own life at risk. I’ve read books from three of the worlds; the only one I haven’t read yet is the Heart of Gold series. All the new stories sound like great additions though and I can’t wait to get my hands on it! 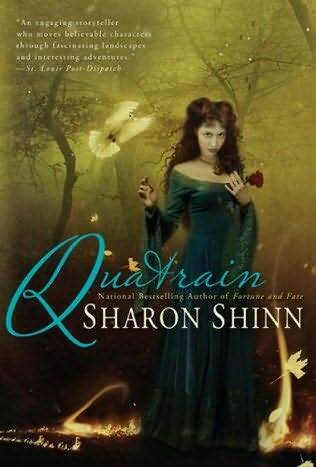 Quatrain by Sharon Shinn is available on Amazon.co.uk for £4.98 and on Amazon.com for $9.12.